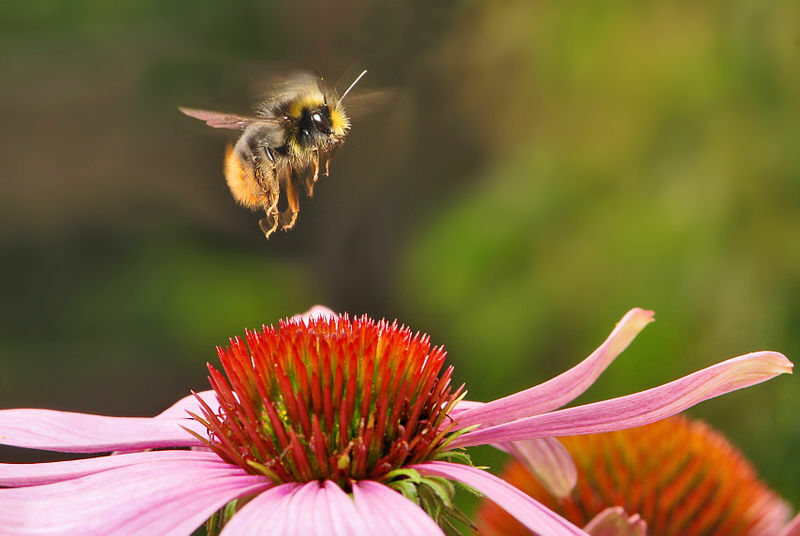 Many people have heard the tale of bumblebees not being able to fly. How could this be possible? This little white lie was created without any documentation of who made the calculation and when.In the story, the unnamed aerodynamicist was at dinner with a biologist and became interested in the topic of aerodynamic capabilites of the wings of bees and wasps. The aerodynamicist assumed the wings were smooth, flat plates and that they would be easy susceptible to wing stalling. 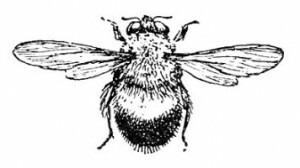 He claims that his calculations “proved” the bee to be incapable of flight because it cannot (in terms of wing size or beats per second) fly with the degree of wing loading necessary. His assumptions however, were completely wrong. He later discovered that he made a mistake when examining a bee’s wing under a microscope—but it was too late. The monster myth was already created and into the hands of the public. This is an image of a bumblebee taken from Wikimedia Commons. This is an image of a bumblebee take from kellscraft.com. Unlike airplanes, insect wings are flexible and their changes are crucial to being able to produce lift. Due to insects’ viscosity, they are burdened with a considerable amount of air on them as they fly. Also, the air never reaches equilibrium on the wings of insects with high wing beat frequencies. Seemingly contradictory, they maintain a balanced imbalance of the airflow acting on their wings. The bumblebee’s combination of high wing beat frequencies and small size produces high lift coefficients, obviously enabling flight. It has been discovered that the calculations made by those who claim the bumblebee cannot fly were solely based on “a simplified linear treatment of oscillating aerofoils” which assumes small amplitude oscillation. Basing calculations on this technique means ignoring dynamic stall, a flow separation that induces a large vortex above the wing and the lift of the aerofoil in regular flight produced by the vortex. John Maynard Smith claimed that because of the small wing area of bumblebees, they would not be able to produce enough energy to sustain flight. However, when Smith performed experiments he proved himself to be wrong. He used viscosity to disprove his own claim. Viscosity is the quantity used to express the magnitude of internal friction, causing something to be a certain consistency, which is measured in force per unit area resisting a flow. Smith used this to say that at the scale of such small insects their wings can “move” a large amount of air, relative to their size. Since they can achieve this, the energy it takes to sustain flight is not very high and therefore they most certainly can fly. It should probably say “Due to insects’ size, they are burdened with a considerable amount of air resistance due to viscosity …” (the viscosity is a characteristic of the air, but it is felt more and more intensely as size goes down.